Call of Duty is arguably one of the most popular video game franchises in existence. Having finally recently played Call of Duty 2, I can now say I played every game in the series up until now. Call of Duty basically started when a lot of key talent jumped ship from 2015, Inc., the developer of the highly successful Medal of Honor: Allied Assault, and decided to one-up EA by making their own World War II shooter. Their company eventually came to be known as Infinity Ward, and Call of Duty was published by Activision. Call of Duty had two things that set it apart from Medal of Honor: You are not an American soldier the entire time and you don’t fight the German war machine alone. Call of Duty was known for filling the screen with friendly NPCs that more or less acted as cannon-fodder while it’s still up to the player to complete key objectives. Also, there were three separate campaigns. You start with as an American paratrooper. Then you take on the role of a British SAS operative. Finally, you steamroll through the German army, Russian style. The Russian campaign (complete with Enemy at the Gates references) was definitely the highlight of Call of Duty as the Eastern Front up until then was largely not covered by the American video game industry, despite there already being a glut of World War II games out there. At the same time, the British missions, probably because of their covert nature, felt like the game fell back on its Medal of Honor roots by once again pitching you against the entire German army. In general, what made Call of Duty enjoyable was a reasonably long and challenging campaign and giving you the chance to use historically accurate guns to play through some of the major events of the war. Setting-wise, Call of Duty 2 was almost identical to its predecessor. The campaign started you as a Russian soldier defending Moscow and Stalingrad. Then you are a British desert rat halting Rommel’s advance in North Africa. Finally, you push through Western Europe as a US Army Ranger. However, the gameplay was changed pretty significantly from CoD1. In CoD1, you had a health bar and could carry 2 main weapons in addition to your pistol and grenades. CoD2 was the first to opt for the Halo-style health regeneration where you die if you take too many shots at once, but you recover good as new if you stay in cover without sustaining more damage for a few seconds. Furthermore, in addition to your grenades (here you both frags and smoke grenades), you may only carry 2 guns, so a pistol can eat up one of those slots. I think these gameplay changes were ultimately in place because Infinity Ward wanted to make the series more console-friendly and thus made the game a little more Halo-like. Aside from some pretty bad AI, CoD2 was a good game nonetheless with some seriously intense battles, all presented in (considering the time) some seriously good graphics. While the PC version was known to slow down unless it had the top of the line specs, the 360 version always ran smoothly. 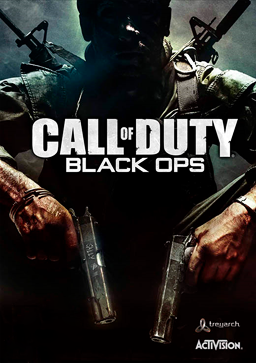 While Infinity Ward created the main games in the series, Treyarch developed the “side” games Call of Duty: Finest Hour and Call of Duty 2: Big Red One, neither of which met with the same critical appraise as the games in the main series.This time, Treyarch also got to make a game in the main series. 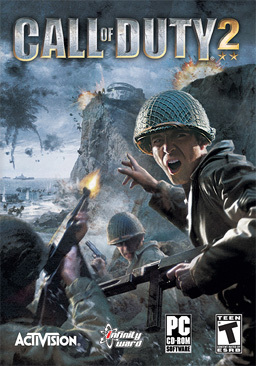 In terms of gameplay, CoD3 was identical to CoD2. 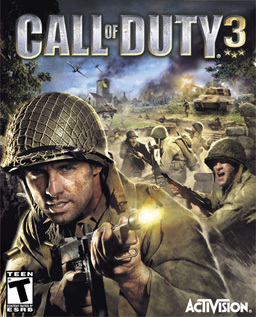 However, CoD3 was the first game in the main series to have a real story. Instead of separate campaigns, the game alternates between the perspectives of an American infantryman, a British paratrooper, a Canadian solider, and a Polish tank crewman while they all fight in the Normandy Breakout campaign. While Call of Duty 2 was a straight-faced World War II shooter, 3 wound up feeling campy. Just about every attempt to stir up emotions (like the death of an American sergeant) fell flat on its face, and that may have been due to the completely forgettable characters. Ridiculous accents did nothing to help the Canadian or Polish missions. Also while all the characters you play as were supposed to be fighting toward a common goal, the individual stories felt very disjoint. Finally, the issue I had was that none of the player characters themselves had much consequence to the story. Ultimately, I felt like a stunt-double who was supposed to do the dangerous stunts (i.e. the majority of the Nazi killing) and then get out of the way for the main actors to take center stage. Call of Duty 3 was the first game in the series I played, and I was disappointed enough to really hesitate playing the next game, Call of Duty 4: Modern Warfare (2007). As the title implies, CoD4 took the series out of its World War II setting and wrote an original story in which you alternate playing as a British SAS soldier and an American Marine fighting a fictional war in the near future. I would have to agree with just about everyone that bringing the CoD series out of the war that has been done to death in the world of video games was definitely a refreshing thing. The gameplay was largely the same as Call of Duty 2, but here you wield M16s and AKs instead of bolt-action rifles, and terrorists replace Nazis as your enemy. The campaign was, in my opinion, nothing short of brilliant. In fact, the games that followed CoD4 were simply unable to match what was in this game. The story was largely no-frills and simply served its purpose of providing a backdrop for really exciting missions set in the Middle East and in Russia. Sadly, the campaign was only about 5 hours long. 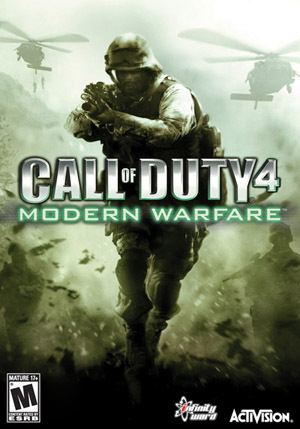 CoD4 was also the start of the series really beginning to focus on the multiplayer, often sacrificing development of the single-player in the process. The multiplayer was definitely fun, mainly because of the customizable characters you can create to play with and the variety of game modes. 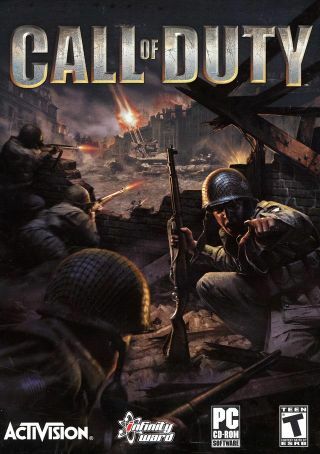 Starting this game onward, Activision started the tradition of launching a new Call of Duty every year. 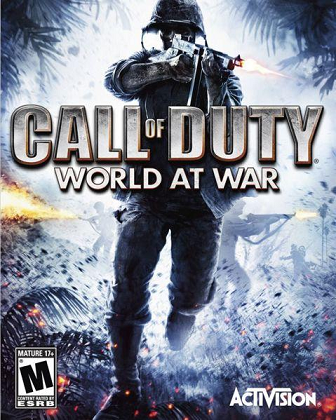 In 2008, the series was given back to Treyarch, and they came out with Call of Duty: World at War. As the title implies, the series took a step backward, and is once again set in World War II. Once again, you play as a Russian infantryman defending against the German assault on Stalingrad, and then making the push into Berlin. What is different is the American campaign; this time you are a Marine fighting against the Japanese in the Pacific. If anything, Treyarch seemed like it was trying a little too hard to make another Modern Warfare, only having it set in World War II. A good example of this was the level in which you are a gunner on a US aircraft. There was also a level in CoD4 with exactly the same description: You are a gunner on a US aircraft. Admittedly, a PBY Catalina is not exactly the same as an AC-130, but the levels were largely in the same spirit. While Treyarch was trying to (and mostly succeeding in) remind you that World War II was probably the single most terrible thing to ever happen in human history, as a game it didn’t really explore much in the way of new territory. The weapons (aside from the addition of Japanese ones) you use are more or less the same that you used in prior games. It didn’t help that I completed the campaign the same weekend I got it; good thing I was only borrowing this game from a friend instead of buying it for myself. 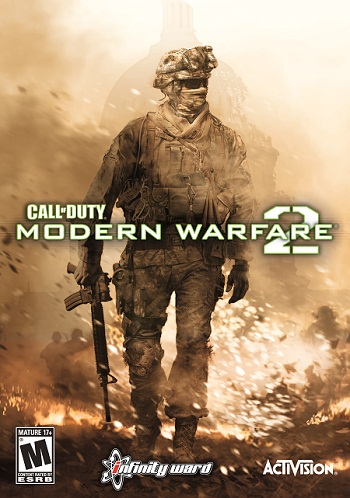 In 2009, Infinity Ward launched Call of Duty: Modern Warfare 2. Infinity Ward actually considered dropping “Call of Duty” from the title and releasing it simply as “Modern Warfare 2,” but that was ultimately decided against. This game was the first in the series to be a true sequel, in this case to CoD4. As I said before, Call of Duty 4 had the best campaign in the series, and Modern Warfare 2 very much did fall pretty short of the mark CoD4 set. The story, in what seemed like an attempt to cram in the maximum number of references to popular action movies, turned into a mess where events that transpired ranged from the improbable (two British soldiers taking down an entire Russian airbase) to just stupid (two British soldiers fighting through mercenaries to hunt down an American general for revenge). It didn’t help that MW2 had the easiest campaign, so I literally beat it on the Normal setting the same day I bought it. The veteran setting actually wasn’t that hard in this game either. Once again, Infinity Ward appeared to have really concentrated on the multiplayer, again sacrificing the single-player component. Even the multiplayer wound up turning into a completely unbalanced mess. The newly added customizable killstreaks (like the chopper gunner) made getting spawn-killed an all-too-frequent occurrence; it didn’t help the game’s spawn system isn’t that smart in that you very much can spawn right in the middle of a firefight. Overall, I actually felt Modern Warfare 2 was the biggest disappointment since Call of Duty 3. However, in 2010, Treyarch actually made a game that was better than the most recent Infinity Ward release: Call of Duty: Black Ops. Black Ops was set in the Cold War. While historical authenticity was largely ignored, Black Ops did create an exciting story set in the 1960s. Unlike in the previous games, your character, Alex Mason, actually has an entire backstory, not to mention voice-acting, and thus not being a silent protagonist. The story is basically that you, as Mason, wake up being interrogated about numbers constantly playing in your head. You have no idea who your captors are or what they want with the numbers in your head, or even why you have numbers to begin with, and thus you start remembering the events that transpired leading up to your eventual capture, starting with the unsuccessful Bay of Pigs invasion. While Black Ops still has customizable killstreaks, they somehow still felt more balanced than those in MW2, and that may be because you’re also given a specific number of points per level up that you may use to unlock things with. Even then I felt like the multiplayer wasn’t really anything that I haven’t seen before. However, the single-player this time was almost as good as that of CoD4, so I’ll say that Black Ops is definitely worth playing, more so than the 2 games that preceded it.